Vintage 18k Yellow Gold Platinum Diamond Ring. 5 ½. Solitaire ¼ Carat Diamond. 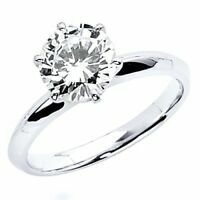 Platinum diamond engagement ring w/18K 1.5C round brilliant VVS baguette 2 CTW!